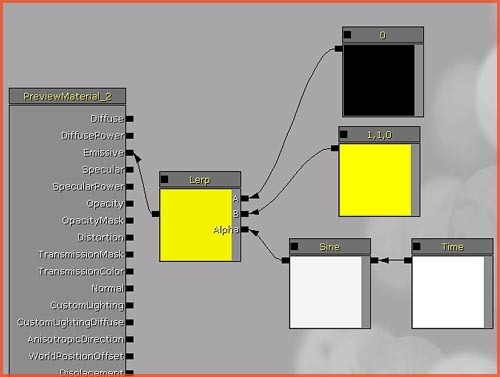 About : This tutorial will explain what lightfunctions are and how they can be used in Unreal Engine 3.
also projects a texture or color on to a surface and is great for faking advanced lighting effects. Please note that Lightfunctions are a Dynamic Light feature. Any light with a Lightfunction will become Dynamic, obviously having quite an impact on performance. Use these sparsely! empty spot) and scroll down a little. Go to the section Usage and enable Used As Light Function. In later versions of the engine this section has been renamed to Mutually Exclusive Usage. Optionally you can also set LightingModel to MLM Unlit although visually this will not have any effect but it does reduce the number of instructions. 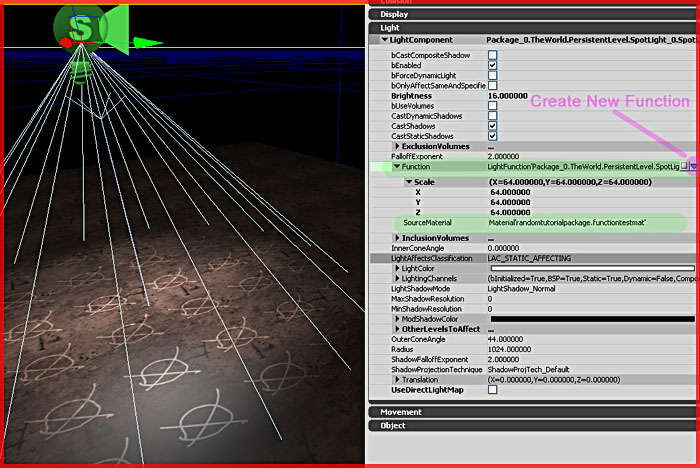 You can also set a material to display only once, ideal for those effects you only want to show once, such as shadows. 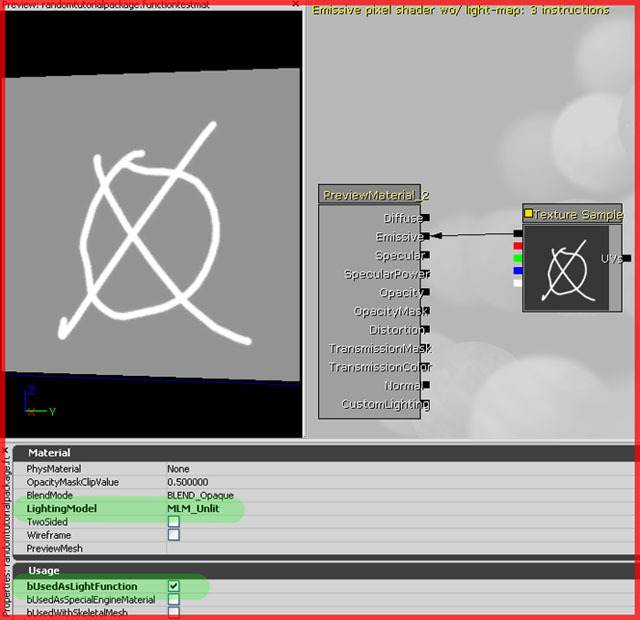 To do so you first need to set the texture itself to Clamp mode instead of wrap mode. Rightclick the texture itself (not the material) in the Generic Browser, open its properties, and change the settings marked. Once done, you should open the material, and add a Panner and a Constant expression to the Texture Sample you already had. Configure them as shown. The setup will offset the texture by half a space to counter the offsetting the lightfunctions always applies to everything. Without the Panner and Constant, the material would not show right below the Light. Making a light pulse is easy. Set up a material as shown below and you’re done! As explained in my material tutorials, the Sine and Time will make things pulse. The variable inside Sine controls the speed of the animation. 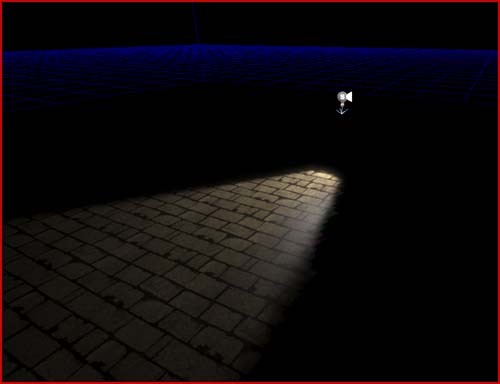 To create a searchlight you need to darken everything except the lightbeam. To do this you need a texture with a black background, contrary to the neutral (=invisible) gray background shown in the first example of this tutorial. Set up the material as shown. Basically identical to the non tillable example discussed earlier, with an extra Rotator in between. The opposite must be done for shadows. Gray background, black shape.